Shooting victims Arthur Redelfs and Lesley Enriquez lived in El Paso, Texas. Washington (CNN) -- More than 200 federal, state and local law enforcement personnel have been assigned to an operation intended to find who was responsible for Saturday's fatal shootings of three people linked to the U.S. consulate in Cuidad Juarez, Mexico, an official said. Among the agencies involved in Operation Knock Down -- taking place in southern New Mexico and in the vicinity of El Paso, Texas -- are the FBI and the Drug Enforcement Administration, said DEA spokesman David Ausiello. El Paso is across the Rio Grande from Ciudad Juarez. A law enforcement official said investigators believe that there could be a connection between Barrio Azteca, a gang that operates in both cities, and the killings. The official said that mistaken identity has not been ruled out. A relative of U.S. consulate worker Lesley Ann Enriquez said Wednesday that the 35-year-old woman was four months pregnant with a boy when she was shot dead. 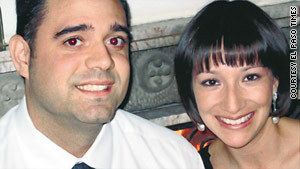 Enriquez's husband, 34-year-old Arthur Redelfs, was also killed. He was a 10-year veteran of the El Paso County Sheriff's Office. The couple was fired on in their SUV as they left a birthday party at the U.S. consulate. Their 7-month-old daughter, Rebecca, who was in the back of the SUV, was unhurt. A third victim, who had also left the party, was identified as Jorge Alberto Salcido Ceniceros, 37, a state police officer who was married to a Mexican employee of the U.S. consulate. "We have all come together to find Barrio Azteca members as part of a major intelligence effort," said Andrea Simmons, a public information officer for the FBI in El Paso. In addition to the FBI and the DEA, other organizations involved are the Immigration and Customs Enforcement, U.S. Customs and Border Protection, the El Paso Police Department, the El Paso County Sheriff's Office and the Texas Department of Public Safety. "Part of this is being done to generate leads regarding the ongoing investigation in Juarez as well as an opportunity to gather information on the location of Eduardo Ravelo, one of the top 10 fugitives," she said. The FBI is offering $100,000 for information leading to the arrest of Ravelo, who is accused of being a leader of Barrio Azteca. This week, Mexican President Felipe Calderon made his third visit in slightly more than a month to Ciudad Juarez. Its more than 2,600 drug-related deaths last year made it the most violent city in Mexico. No official numbers are available, but more than 400 killings have been reported in local media this year. CNN's Arthur Brice contributed to this story.